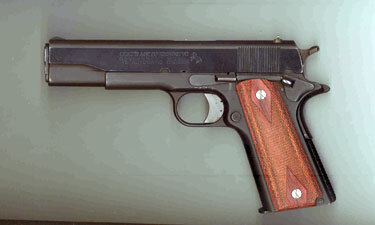 My solution: M1911A1 Semi-Automatic .45 ACP. The Army’s troubled program to buy a new standard-issue handgun for soldiers was the subject of renewed debate on Capitol Hill. During Thursday’s confirmation hearing for retired Marine Gen. James Mattis to become defense secretary in the Trump administration, Republican Sens. Joni Ernst of Iowa and Thom Tillis of North Carolina took turns criticizing the service’s XM17 Modular Handgun System (MHS) program, a $350 million competition to buy a replacement to the Cold War-era M9 9mm pistol. At a time when Russia is upgrading its service rifle, “we continue to modify our M4s [and] many of our troops still carry M16s, the Army can’t even figure out how to replace the M9 pistol, first issued in 1982,” Ernst said. Ernst blasted the Modular Handgun Program’s many requirements. “Take a look at their 350-page micromanaging requirements document if you want to know why it’s taking so long to get this accomplished,” she said. She also mocked the stopping power of the 5.56mm rifle round. “Our military currently shoots a bullet that, as you know, is illegal for shooting small deer in nearly all states due to its lack of killing power,” she said. Tillis went even further by showing up to the hearing with the pistol program’s full several hundred pages of requirements documents wrapped in red ribbon. “This is a great testament to what’s wrong with defense acquisition,” he said, slapping the three-inch-tall stack of paperwork. Coincidentally, Army Chief of Staff Gen. Mark Milley was asked about the program earlier in the day at a breakfast sponsored by the Association of the United States Army. Milley was tight-lipped about the effort but hinted the service is making progress. Beretta, FN Herstal, Sig Sauer and Glock are reportedly still competing for the program after the Army dropped Smith & Wesson from the competition last year. We’re hoping these gunmakers will help shed more light on the status of the program next week at SHOT Show in Las Vegas. Hell, I’ll solve their dilemma for them for half of that. 4 Feedbacks on "Army Spent $350 Million to Pick a New Handgun Without Result"
I completely agree that we should go back to the 1911 in .45 ACP. It is beautifully simple, serviceable, and effective. I doubt the powers that be will do it, though, because of their irrational fear of “cocked and locked” carry. I love it. It’s superbly accurate at the distances needed, easy to shoot, despite its detractors, it’s flat and easy to carry, even concealed, and it packs a wallop. I believe “soldiers” don’t carry pistols. Just the aforementioned pea shooting rifle. As I was taught during my service, the pistol was a “Personal Defense Weapon” provided (usually) to officers, and to members of “Weapons Teams” (Mortar, Artillery, Machine Guns, etc. ); those enlisted personnel whose primary mission is to service a crew-served weapon. In that role, magazine capacity is not an issue. The need is for a sidearm which can remain reliably functional even when it has received little or no maintenance functions for months during the most abysmal conditions. Didn’t Remington recently come up with a polymer-frame .45 with like a 16-round magazine? If the Pentagon’s problem with the 1911 is capacity, that would solve it.